PINTADAS, Brazil, May 22 2018 (IPS) - The small pulp mill that uses native fruits that were previously discarded is a synthesis of the multiple objectives of the Adapta Sertão project, a programme created to build resilience to climate change in Brazil’s most vulnerable region. The new commercial value stimulates the conservation and cultivation of the umbú (Spondias tuberosa) and umbú-cajá (Spondias bahiensis) fruit trees of the Anacardiaceae family, putting a halt to deforestation that has already devastated half of the original vegetation of the caatinga, the semi-arid biome of the Brazilian northeast region, covering 844,000 square km. “I sold 500 kilos of umbú this year to the Ser do Sertão Cooperative,” Adelso Lima dos Santos, a 52-year-old farmer with three children, told IPS proudly. Since he owns only one hectare of land, he harvested the fruits on neighbouring farms where they used to throw out what they could not consume. For each tonne the cooperative, which owns the small factory, pays its members 1.50 Brazilian reals (42 cents) per kg of fruit and a little less to non-members. In the poor and inhospitable semi-arid interior of the Northeast, known as the sertão, the income is more than welcome. “A supplier managed to sell us 3,600 kg,” the cooperative’s commercial director and factory manager, Girlene Oliveira, 40, who has two daughters, told IPS. Pulp production also generates income for the six local women who work at the plant. It contributes to women’s empowerment, another condition for sustainable development in the face of future climate adversities, said Thais Corral, co-founder of Adapta Sertão and coordinator of the non-governmental Human Development Network (REDEH), based in Rio de Janeiro. 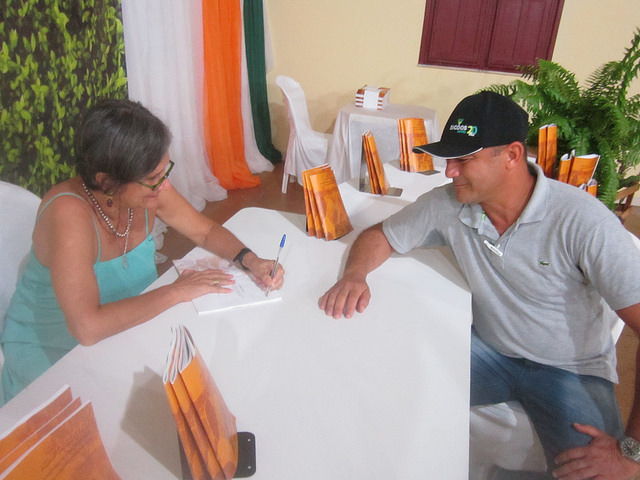 The pulp mill began operating in December 2016 in Pintadas, a town of 11,000 inhabitants in the interior of the state of Bahia, and its activity is expanding rapidly. In 2017, it produced 27 tonnes, a figure already reached during the first quarter of this year, when it had orders for 72 tonnes. But its capacity to process 8,000 tonnes per day remains underutilised. It currently operates only eight days a month on average. The limitation is in sales, on the one hand, and of raw material, whose supply is seasonal and therefore requires storage in a cold chamber, which has a capacity of only 28 tons. 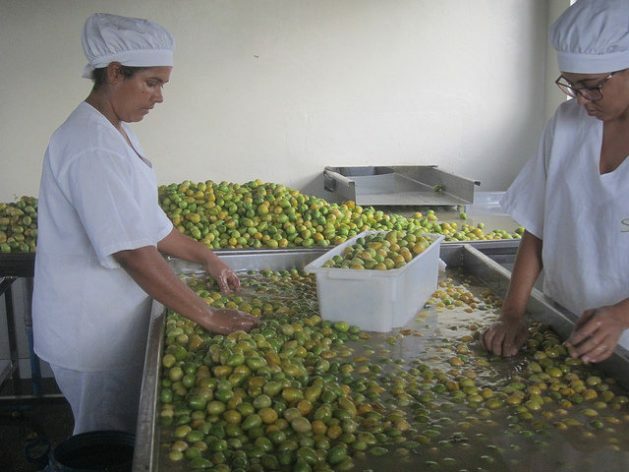 In addition to umbú and umbú-cajá, harvested in the first quarter of the year, the factory produces pulp from other fruits, such as pineapple, mango, guava and acerola or West Indian cherry (Malpighia emarginata), available the rest of the year. Also, it has five other kinds of fruit for possible future production and is testing another 16. The severe drought that hit the caatinga in the last six years caused some local fruits to disappear, such as the pitanga (Eugenia uniflora). The Productive Cooperative of the Region of Piemonte de Diamantina (Coopes), whose members are all women, is another community initiative born in 2005 in Capim Grosso, 75 km from Pintadas, to process the licuri palm nut (Syagus coronate), from a palm tree in danger of going extinct. More than 30 food and cosmetic products are made from the licuri palm nut. Its growing value is also helping to drive the revitalisation of the caatinga, vital in Adapta Sertão’s environmental and water sustainability strategies. This programme, focused on adapting family farming to climate change, has mobilised nine cooperatives and some twenty local and national organisations over the last 12 years in the Jacuipe River basin, which encompasses 16 municipalities in the interior of the state of Bahia. It was terminated in April with the publication of a book that tells its story, written by Dutch journalist Ineke Holtwijk, a former correspondent for Dutch media in Latin America and for IPS in her country. Having more than doubled milk production on some of the farms assisted by the programme, winning 10 awards and introducing technical innovations to overcome the six-year drought in the semi-arid ecoregion are some of the programme’s achievements. Brazil’s semi-arid region covers 982,000 square km, with a population of 27 million of the country’s 208 million inhabitants. The region’s population is 38 percent rural, compared to a national average of less than 20 percent, who depend mainly on family farming. The programme’s legacy also includes the training of 300 farming families in innovative technologies, the strengthening of cooperativism and a register of family farms to sustain production throughout at least three years of severe drought. A focus on the long term, with adjustments and the incorporation of factors discovered along the way, was key to success, said Thais Corral about the programme, which was broken down into four phases over the last 12 years. Starting in 2006, under the title Pintadas Solar, it tried to introduce and test solar pump irrigation, to meet the demands of women tired of transporting heavy buckets to water their gardens. “But the solar panels and equipment were too expensive at the time,” said Florisvaldo Merces, a technician working for the programme since its inception and now an official of the municipality of Pintadas in the agricultural sector. Problems such as salinisation of the soil because of the brackish water from the wells and the difficulty in maintaining the equipment were added to the emergence of other agricultural issues to extend assistance to small farmers and the area of intervention to other municipalities in addition to Pintadas. Problems such as the salinisation of the soil by brackish water from the wells and difficulty in maintaining the teams were added to other agricultural issues of emergency to extend the assistance to small farmers and the area of intervention to other municipalities, in addition to Pintadas. Credit, the production chain, cooperatives, water storage and climate change dictated other priorities and transformed the programme, including its name, which was replaced by Adapta Sertão in 2008, when the Ser do Sertão Cooperative was also created. Research, conducted in partnership with universities, found that the temperature in the Jacuipe basin increased 1.75 degrees Celsius from 1962 to 2012, compared to the average global rise of 0.8 degrees Celsius, while rainfall decreased 30 percent. The programme had to test its strategies and techniques in the midst of the longest drought in the semi-arid region’s documented history, as a formula capable of sustaining production and maintaining quality of life as climate problems worsen. 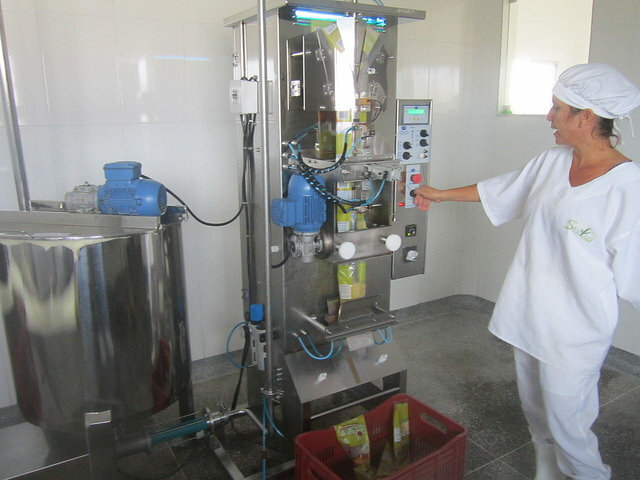 It tries to respond to the challenge with the Intelligent and Sustainable Smart Agro-climatic Module (MAIS), the model for planning, productivity improvement, mechanisation and optimisation of inputs, especially water, in which Adapta Sertão trained 100 family farmers. The aim is to “turn farmers into entrepreneurs, who record all production costs,” said Thiago Lima, a MAIS technician in sheep-farming, who now intends to apply his knowledge to his 12-hectare farm. “Transforming complex technologies into simple ones” is the solution, Merces told IPS. 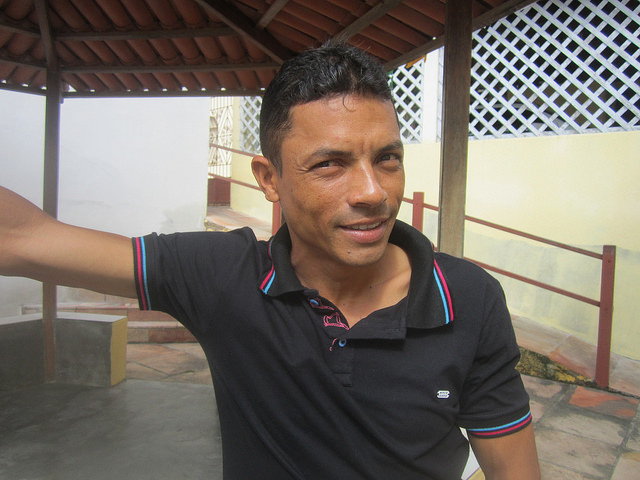 “The promoters’ sensitivity to talking with local people, carrying out research and not coming with already prepared proposals, favouring actions in tune with local forces,” was the main quality of the programme, acknowledged Neusa Cadore, former mayor of Pintadas and now state representative for the state of Bahia. “But there was a lack of alignment with the government. We did everything with private stake-holders, foundations, cooperatives and local authorities, always hindered by the government. Ideally, Adapta Sertão should be adopted as a public policy for climate-resilient family farming,” Corral told IPS. The company Adapta Group, created by the other founder of the programme, Italian engineer Daniele Cesano, will seek to spread the MAIS model as a business. But Corral disagrees with the emphasis on dairy farming, which has presented the best economic results, but which requires 18 hectares and large investments, excluding most families and women, who prefer to grow vegetables. Also, she says that not enough importance is placed on the environment and thus long-term resilience.